URBANA, Ill. – How will the world eat in the face of climate change and other threats? 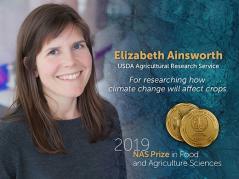 That question dominates Elizabeth Ainsworth’s pioneering research, which has helped to reveal how man-made atmospheric changes will affect the physiology and growth of crops around the world. Ainsworth, a USDA Agricultural Research Service scientist in the Global Change and Photosynthesis Research Unit, led the evolution of the SoyFACE Global Change Research Facility, where she serves as lead investigator. There, she has conducted groundbreaking research to show how crops such as maize and soybeans will be affected by increases in atmospheric carbon dioxide and ozone in combination with drought and other environmental stresses, as well as possible solutions. The work recently revealed that a large portion of the United States harvest of corn and soybean was lost due to ozone pollution over the past 20 years. "We’re thrilled Dr. Ainsworth is being recognized by the National Academy of Sciences. The caliber of her agricultural research and depth of her service to science is inspiring," says Martin Williams, acting research leader of the USDA-ARS Global Change and Photosynthesis Research Unit. "We’re also honored that now two of the three recipients of the NAS Prize in Food and Agriculture are USDA-ARS scientists." In addition to her research itself, Ainsworth is also recognized for her tireless advocacy for science, both as a science ambassador and as a role model for the next generation of scientists. She frequently speaks to the media about climate change, and she started the Pollen Power Camp to encourage junior high-school girls to consider science careers. As an adjunct professor affiliated with the Department of Crop Sciences and the School of Integrative Biology at the University of Illinois, Ainsworth has also mentored countless university students and postdoctoral researchers, helping to ensure that a new wave of professional biologists will follow her lead for many years to come. "We are very proud of Dr. Ainsworth, who received her Ph.D. in the Department of Crop Sciences at Illinois," says Adam Davis, head of that department. "Her creative approach to understanding the impacts of global change on agricultural resilience at multiple levels, from gene to plant to ecosystem, and her warm collegiality set an outstanding example for our students to follow." Content adapted from the National Academy of Sciences Awards page. View the full list of recipients here.